Scented candle tins make a fabulous compact gift. These attractive designed, self-contained message tins require no additional holder. All you have to do is unscrew the lid, light the wick and enjoy the comforting, sweet aroma of the vanilla fragrance. These fun and quirky candle holders contain scented candles and make a wonderful gift or indulgent treat! 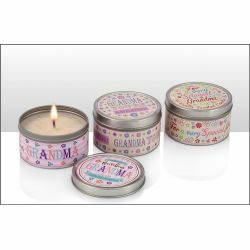 These Grandma message tins are supplied with three assorted designs. The tin is approximately 9cm diameter.